Harshringar, also commonly known as Night Blooming Jasmine in English, Siuli in Bangla, Parijaat or Harshringar in Hindi, is one of the many varieties of highly fragrant Jasmine plants around. What so special about this plant is the distinct shape and colours of these highly fragrant flowers from the Jasminum family. The five petaled flowers have a pedicel (the part that connects the petals to the rest of the plant). In the case of this flower, as common for most of the other varieties of jasmines, the petals are white, however the pedicel is a bright orange, which gives a stunningly brilliant contrasting look to the entire flower. The behaviour of the flowers, which, again, just like most of its cousins in the Jasminum family, bloom after the sunset, however, unlike most others in the family, the Harshringar flowers fall down on the ground before the sun-rise. Given the medium sized tree that Harshringar can be, you could see a strikingly beautiful ground under the tree, if you have one around your home. Ground turns into a white carpet with lots of white flowers (ofcourse depending upon how your tree is blooming), facing down with most of the orange pedicels facing upwards. 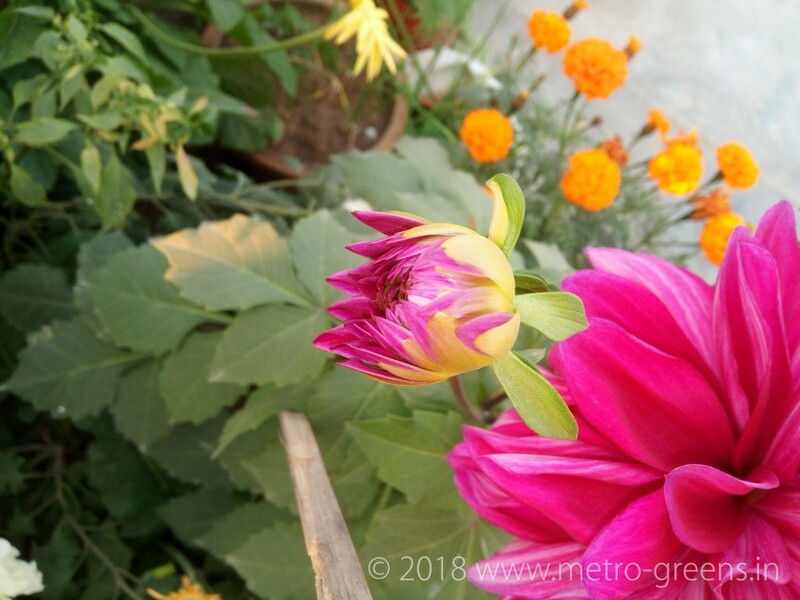 Siuli, as it is commonly called in Bangla, enjoys a special place in Bengali culture, where it enjoys the status of the state flower of West Bengal, India. 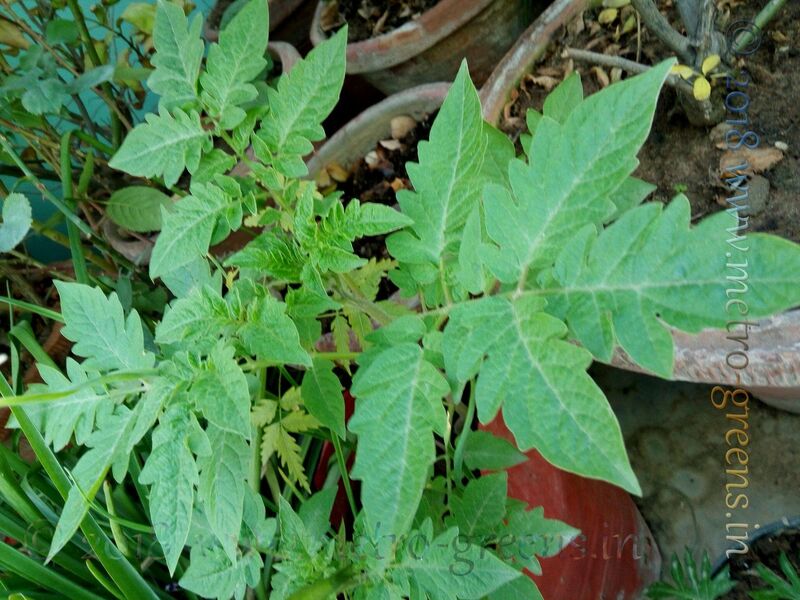 Two years back, I successfully got two plants grown from stem cuttings I brought from a nearby park, after around two years of unsuccessful tries. 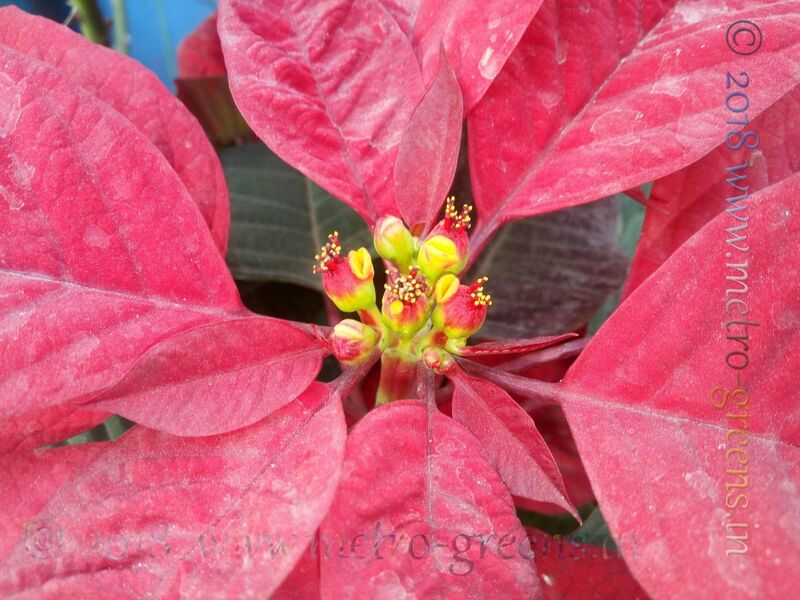 This year around, the both the plants grew well and had lots of flowers. Below is a timelapse video I created while a couple of the flower buds were opening up in the evening. The result? You can watch it on your own. I have had yellow and pink rain lilies for quite some time. I have been in the quest to bring in plants from all over. 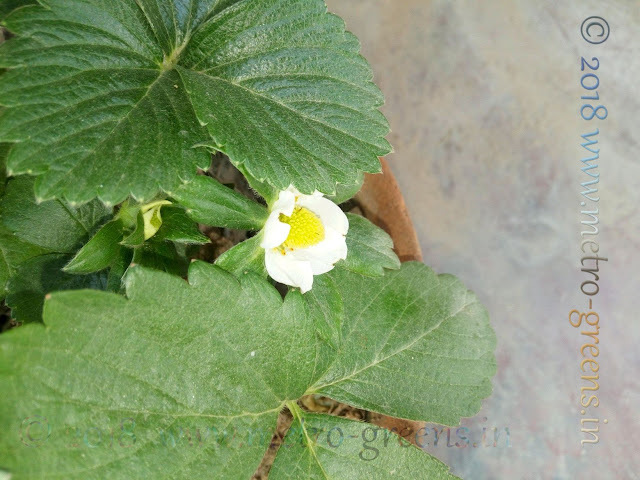 Wherever and whenever I get chance to get myself plants, or seeds if getting the plant is not that easy, I don't miss a chance to grab the opportunity. 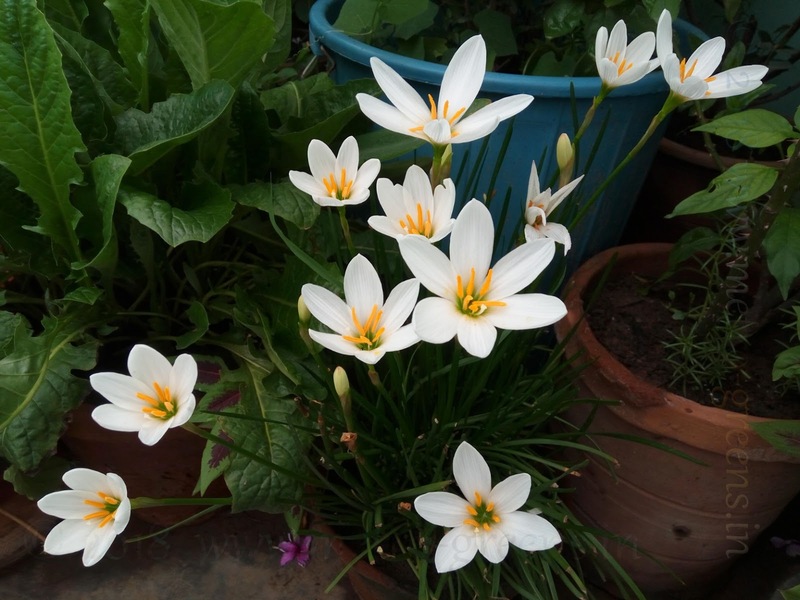 This is how I got the yellow rain lily seeds, while on an official visit to a client's place, where I found seedpods, which were still unripe, but I grabbed the opportunity and got myself the seedpods. Luckily, even the unripe seedpods gave me some useful seeds which let me have my own yellow rain lily plants. The pink one, I bought from a local plants nursery, and I do not remember where and how I got it. The white one, which I added last year to my collection is again a chance encounter with a plants seller, while I was returning back to home from somewhere, around this time last year. That was a bunch which I got for a good price, and while I missed a chance to have blooms last year around this time, this year, it's been different, though, I still couldn't give the plant enough space to spread like this species usually does, it's still thriving good. The rainy season this year seems to be quite long and thus, would be good for the plants, and I will have a great winter season, with numerous winter delights up in blooms. The beautiful juhi plant too is blooming these days, so are the vincas. Up next, I’ve got a great surprise addition to my garden, one that I’ve been trying for quite long, but this time, appears I have been pretty successful, till now. I still have to see a bloom, but am keeping my fingers crossed and hoping for the best. Wishing you all, a very happy new year. The season’s great and while the winter season has almost reached its end, it’s still not the complete end of it. This year, we’ve seen drastically less severe winter season, compared to some years back. 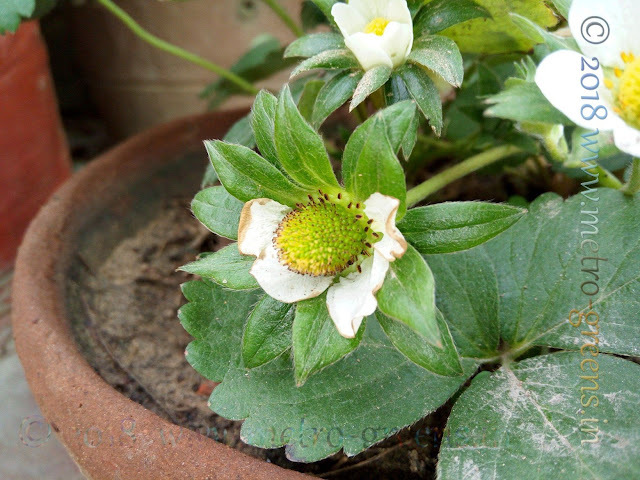 This year around, due to some things that have changed from the previous years, I still haven’t got any winter seasonal plants in my rooftop garden. 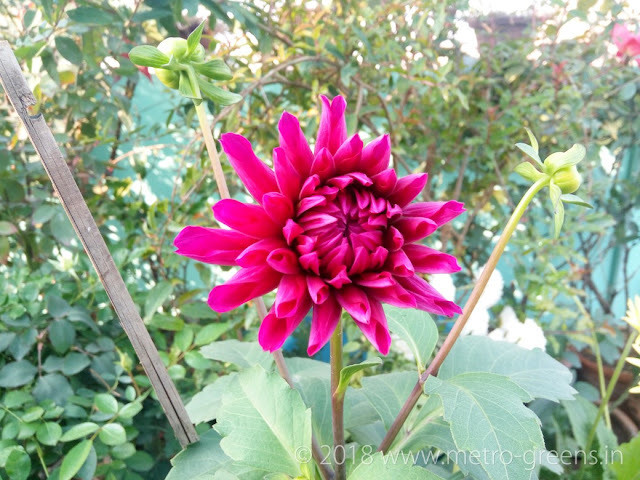 I got some iceplant seeds, which aren’t doing very good, the pink dahlia, which has stayed with me for almost three years now, somehow made its way to grow into a healthy plant, though, this was something that happened with a lot of luck. The chrysanthemums happened to bloom this year too, but, as I’ve been thinking to get some new varieties of chrysanthemums into the garden, since a couple of years, it still couldn’t be done this time too. I always liked the spider varieties of chrysanthemums, the numerous colours and varieties they come in, and have always wanted them in my garden. Hopefully, next year I’ll be able to get some into my rooftop garden. 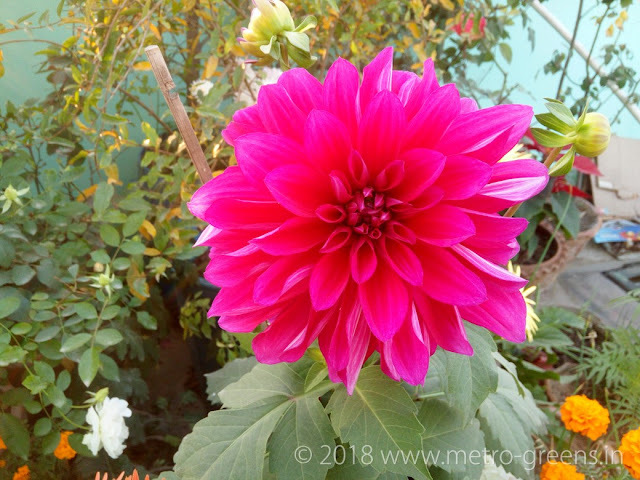 In other stories, the pink dahlia plant, that narrowly escaped dying out while being stored in hibernation, grew to be a healthy and beautiful plant, and has had one of the most beautiful blooms of a very bright dark-pink bloom, in the first dahlia bud that bloomed this season. 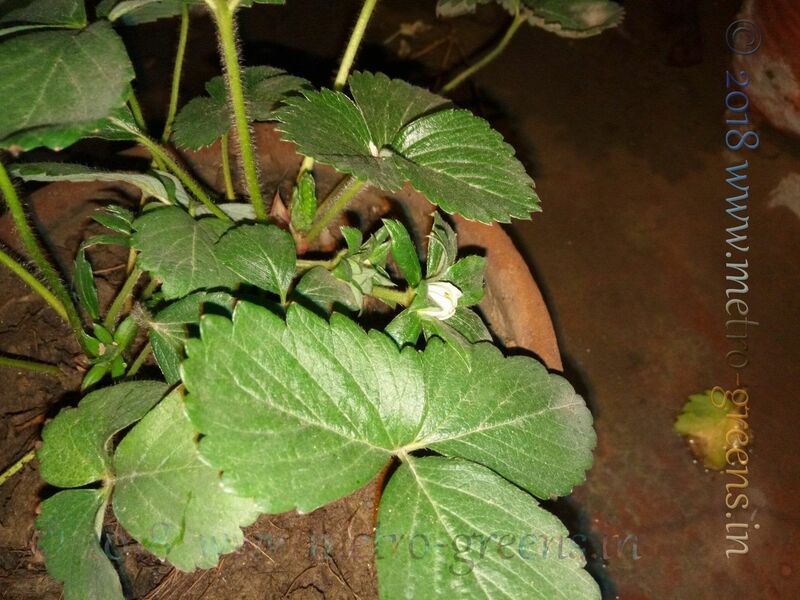 The plant still has a couple of buds, and the second one has started opening up for now. I am expecting a couple of more blooms by then the season will end. Here’s a couple of dahlia blooms for you. Chrysanthemums have bloomed and withered away, since the season has gone. I however have new blooms in the different roses, the white one's blooming beautifully these days, and it's bearing a lot of buds too that are about to bloom in the coming days. The marigolds too are blooming, and have given me colour at a time nothing was there, so is the lone cockscomb plant, the bloom of which has stayed just like that for more than two months now.